As in business and politics, it’s essential when dealing with climate action to follow the money. 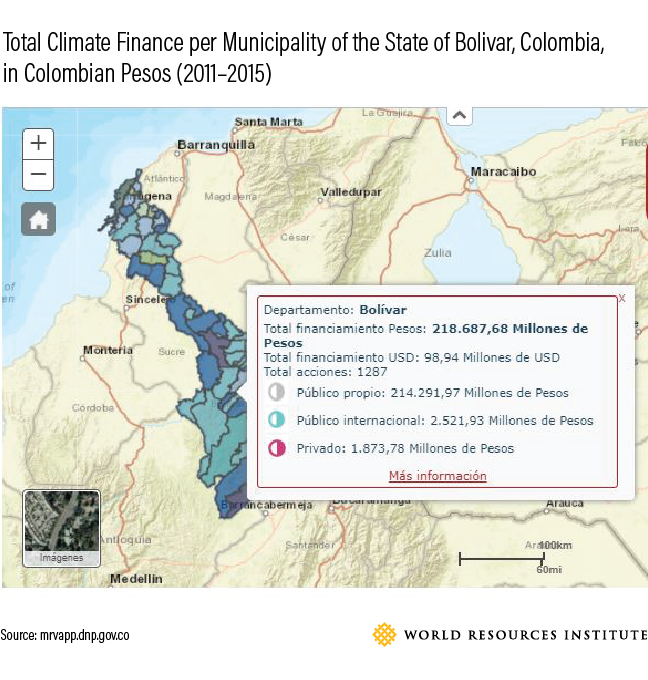 Acknowledging the benefits of more and better information about climate finance , Colombia worked with WRI and its partners on a new system  that helps measure, report and verify (MRV) how much funding goes towards climate change projects. 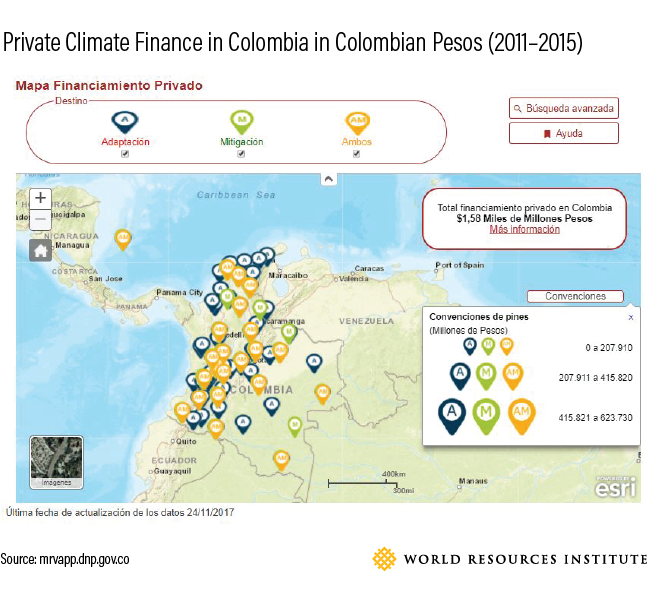 Unlike previous climate finance tracking initiatives , Colombia’s system covers financial sources for both adaptation and mitigation and will make the data publicly available through an online platform (access the platform here ). This government-led effort, launched online on November 27 , registered over 15,000 climate change actions, totaling approximately $6 billion from public sources (both domestic and international) for the period 2011-2015. This fits into a broader climate change information system that will cross-reference climate finance data and data about greenhouse gases emissions in Colombia and could have implications for other developing countries. The system's online platform  presents aggregate data and project-level information in infographics and maps, allowing users to employ various filters to see climate finance data by sector, state, municipality, financial source and financial instrument, among other variables (see images below). Users can also download the databases directly from the platform. This will help give government officials, citizens and other users a more complete picture of climate finance flows, which could lead to improved decision-making and accountability. It will also strengthen international reporting on finance , which is important in the context of the historic Paris Agreement . What Can Improved Data Do for Developing Countries? Climate finance data provides developing countries with an overview of how finance is being used within their borders, including potential financing gaps, enabling them to better manage these resources . For example, by knowing the levels of climate finance by region and/or economic sector, governments can more effectively match priorities and resources. With climate finance data, citizens in developing countries can monitor the use of the resources and hold their governments accountable. Greater data availability can also help make climate finance more transparent, including finance from developed countries and international/multilateral development organizations such as the World Bank, the InterAmerican Development Bank, and Green Climate Fund. It can also provide donor and developing countries with a clearer picture of where the money is going. What Can Other Countries Learn from Colombia’s Experience? Countries working to improve climate finance data can draw several lessons. Aim for a definition of climate finance that fits in the country context but is still relevant internationally. While alignment with internationally recognized methodologies such as the Rio Markers  and the Multilateral Development Banks’ methodology to define climate finance  facilitates comparability across geographies, country actors will be more likely to use consistently a definition that reflects a locally-relevant understanding of climate finance. For example, although many countries include nuclear and large-hydro power generation as mitigation activities, Colombian actors left them out and emphasized other technologies that are better aligned with the country’s priorities. Engage with national and international institutions that will provide information for the system and work with them to formalize their roles. To secure the buy-in of these players, it was critical to show how they will benefit from the tracking exercise. For example, Colombia’s Presidential Agency for Cooperation  and National Department for Planning  will provide data to periodically update information in the system. But these and other government institutions will also be important users of the system, as they have the mandate to coordinate and plan implementation and funding of climate change actions. Leave room for improving the quality of the data. Climate finance data is difficult to collect because it is often dispersed across many sources, which vary in terms of data quality. Colombia’s system will accommodate the addition of more and better climate finance information over time. For example, Colombia’s system allows for adding/changing the geographic location of a climate change action if the information wasn’t available at the time of its registration but is subsequently available. This is critical for projects supported by developed countries and international development organizations, as the exact location is not always set in the beginning of their implementation. With a comprehensive picture of climate finance in Colombia, decision-makers should be able to make informed choices more rapidly on how to tap and manage climate finance flows. Furthermore, country actors and donors should be better positioned to verify whether the information reported corresponds to the projects on the ground. Looking ahead, other countries can learn from Colombia’s experience to effectively implement climate finance specific MRV systems.